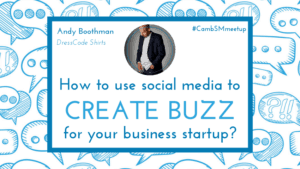 Home / Cambridge Social Media / How to use social media to create buzz for your business startup? 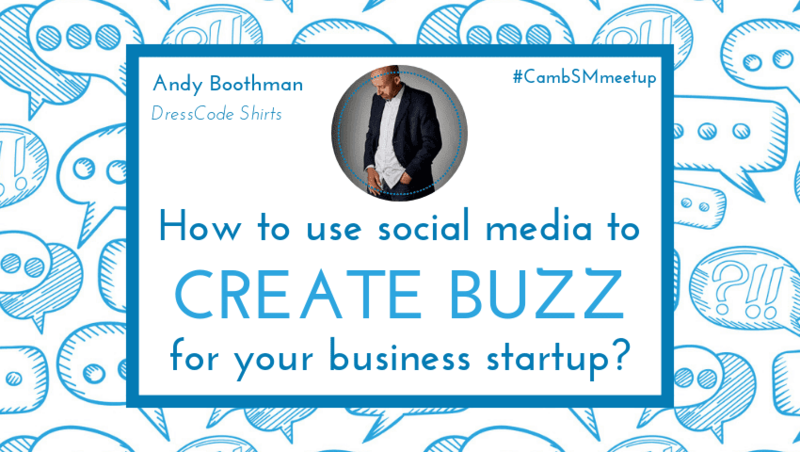 At the March Cambridge Social Media Meetup, we were lucky enough to have Andy Boothman, the founder of DressCode Shirts, come in and talk to us about how social media can be used to create a buzz for your business. While I could never do Andy’s talk the justice it deserves in a blog post (you really had to be there), I have, nevertheless, written this summary to provide an insight for people who weren’t able to attend. Social media offers an incredibly powerful range of channels that many people still don’t understand and don’t leverage properly. Each platform not only has its own personality and style, but also attracts a different audience and boasts a range of creative functionalities. The possibilities (for both individuals and businesses alike) are HUGE, but many people remain unsure about how to best use these channels to their advantage. That’s where Andy was able to give a big helping hand. Andy talked to us about using social media to launch and market your brand, from ideation to proving your business concept and marketing your product/service. First and foremost, you need to spend some time researching. Explore different forums and search for relevant conversations. Then listen! Listen to what people are saying; what their pain points are; and what they wish they had a solution for. 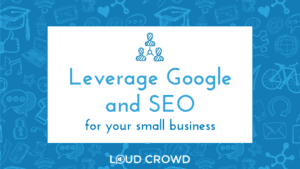 The good news is that you can search by keywords, phrases or people on most platforms, so you can find relevant conversations relatively quickly. Another part of your research should be competitor analysis. Now you don’t want to be like your competitor – the aim isn’t to copy them. But you should be aware of what they’re doing and what’s working for them to be able to prove your business concept, define clear USPs and differentiate your content from theirs. Ask questions, talk with people, join interesting conversations, share your knowledge and showcase your expertise. People will hold you in high regard if you provide them with useful information and insights, which makes pitching to them further down the line that bit easier. Keep notes and segment your audience based on their responses. This will help you with clarifying your offering and/or diversifying your services. Where should you be talking to people? 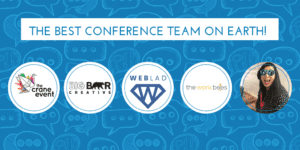 There are plenty options for you to find the right people and join relevant conversations online. Check out Quora, Reddit and other social media networks and forums. During your initial research you should be able to find out which platform(s) would be the best place for your business and your audience. At the end of the day, you need to be where your audience is! Focus your efforts on just one or two platforms (never spread yourself too thinly) and dedicate some time to getting to know the platform, its features and functionalities, as well as the audience that’s hanging out there. Also, make a plan. You can very easily get into a rabbit hole and end up jumping from one platform to the other. What is stopping you from using video for your business more? Is it fear, lack of knowledge, technology, time…? Video is huge (gets tons of reach) and will only get bigger going forward. Find a way to include video into your social media marketing strategy. Make a plan, test it out and just do it! Remember, the video your create and share will always get better results than the one you don’t record or don’t publish, so don’t be shy and get some videos out there for people to consume. Have you ever noticed that people behave differently on social media than they do offline? For some reason, sitting behind a computer makes us forget all the basics of human communication and we go straight into ‘sales and broadcast’ mode. We start hiding behind our brand logo and forget we’re still dealing with other human beings on the other side of the screen. Don’t be a gatecrasher! Behave online the way you’d act at a face-to-face networking event. Be respectful of others, listen more than you talk, offer helpful advice and take time to get to know people. In today’s world it’s much more powerful to let people come to you instead of pushing your messages onto them. Consumers are getting more and more aware of marketing and advertising and they prefer to do their own research and buy stuff on their own terms. Want to know more about DressCode? The power of clothing goes way beyond the ‘I like that’ type of comment. 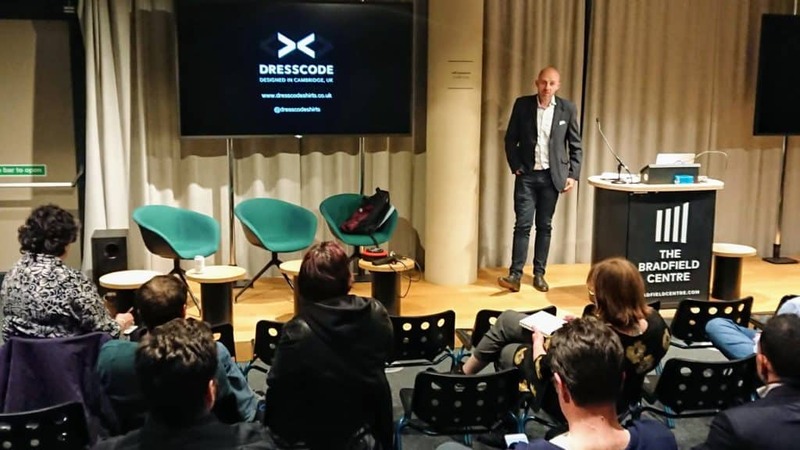 Andy and the DressCode team help businesses to think about the ways they present themselves, their teams and their values. There’s a lot that we can do through the shirts and other items we wear. Have a love weekend I hope to see you soon!